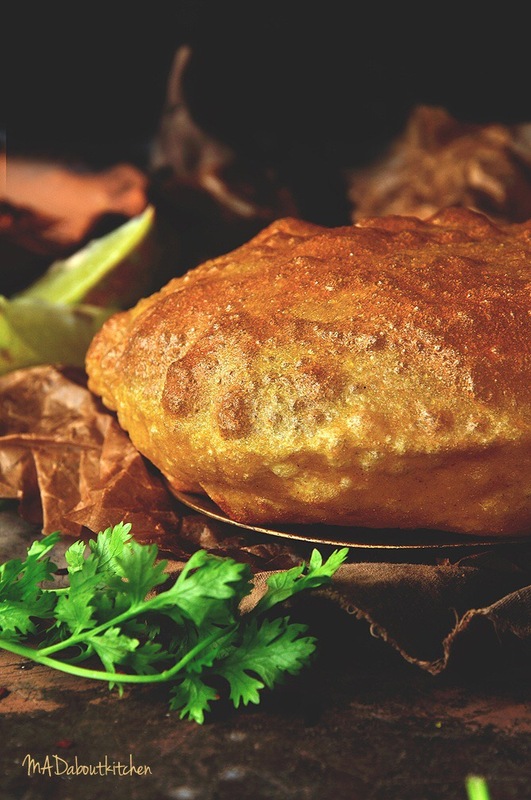 Poori is an unleavened deep fried indian bread. A very common dish in india served with potato curry. And every region has it’s own twist. 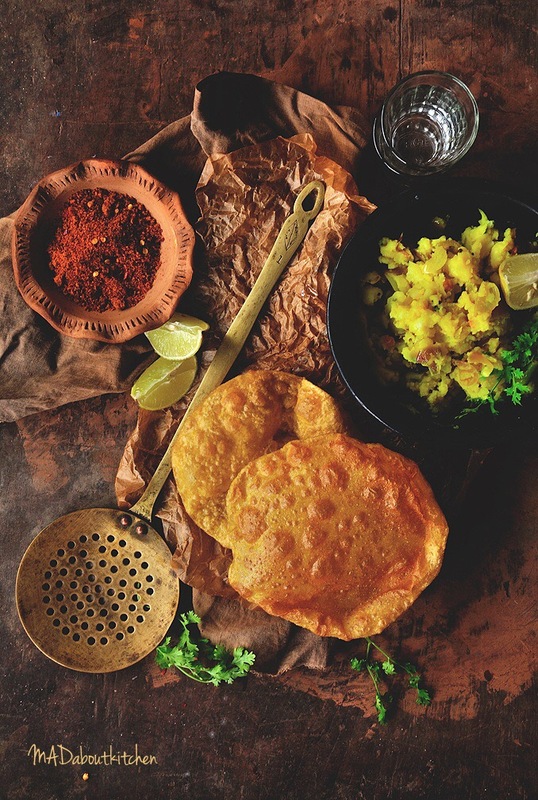 These puffed pooris are crisp yet soft, making it one of the favourite dishes in the country. Very rarely i make fried food… Like once in 6 months. 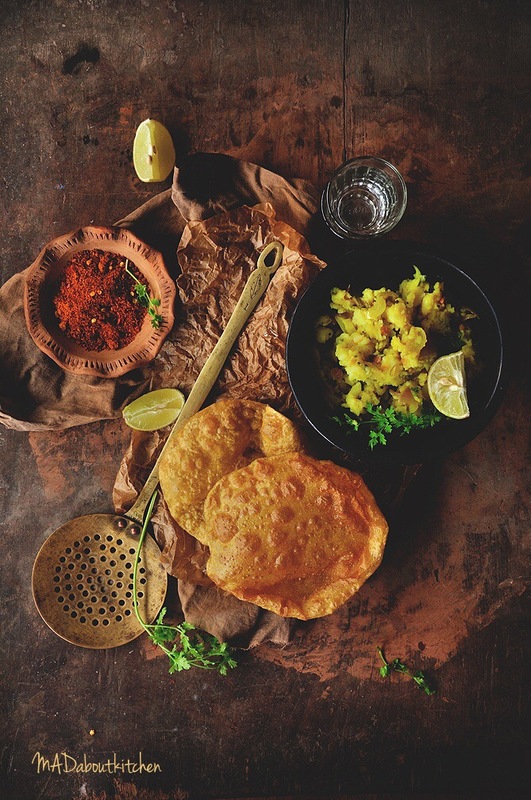 One of those days of the year today… Poori and Aloogedde Palya (Potato curry) a classic combination. Knead all the ingredients for the poori using water. The dough should be harder than the normal roti dough. Not soft. Rest it for 1/2 an hour. Keep the oil to heat in a deep pan. Once rested, make a tsp size balls with the dough. Roll the dough into thin disks (3mm thick). 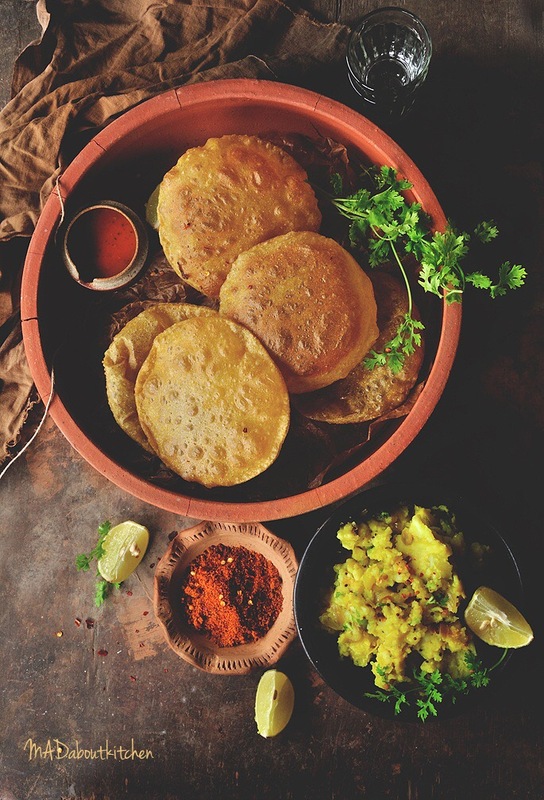 Use a drop of oil instead of flour to roll the pooris. This will ensure the pooris aren’t too dry. Test the oil buy dropping a small bit of the dough into it. If the dough bubbles up and rises up then it is ready. Drop the rolled poori’s into the oil. Using a strainer keep pressing the poori’s into the oil till it puffs up completely. Once puffed, turn them around and fry it for a minute. Remove it onto a paper towel to remove excess oil. Repeat this with all the pooris. In a pan heat a tbsp of oil. Add mustard seeds and let it crackle. Add split bengal gram to this. Let it turn golden. Add curry leaves, chillies, turmeric powder and sauté for few seconds. Add onions and sauté till they turn pink. Mash the boiled potatoes and add it to the onion mixture in the pan. Give it a good mix. Add salt, a pinch of sugar and lemon juice and mix it well. Sprinkle some water, cover the pan with a lid and cook for two minutes. Add grated coconut and chopped coriander and mix it. Love the pics, especially the first one. They are so rustic!